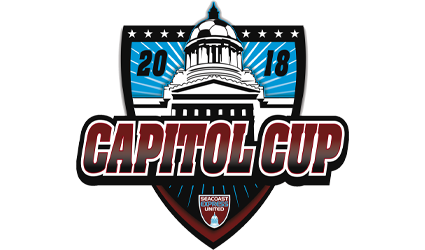 Seacoast Express United is proud to host the 2018 Capitol Cup Columbus Day Soccer Tournament on the campus of New Hampshire Technical Institute over the weekend of October 6-7th! This event offers high-quality competition in a fun, "low-hassle" setting that is perfect for teams of all ages. The 2018 Capitol Cup registration is now closed! U8-U10 teams (7v7) will play a round-robin format with a guarantee of 3 games. For U11-U12 (9v9) and U13-U15 (11v11) age groups, each team is guaranteed 3 matches with a playoff for tournament champion. Scheduling: Please note that we are doing our best to honor as many scheduling requests received prior to September 24th as possible. Now that the divisions and brackets have been published, scheduing will begin on Tuesday, September 25th. While it is difficult to work through a high demand of requests, we are confident that the schedule will look to avoid as many conflicts as possible for those coaches assigned to multiple teams. Matches are played on the campus of NHTI, easily accessible from I-89 and I-93 in Concord, NH and several satellite locations in the Concord/Pembroke/Henniker area. Click here for more information on directions. Please contact Darrell Betley at dbetley@seacoastunited.com or by phone at 603-758-1156 to inquire about available openings within these age groups.